4. The rigid honeycomb walled Bed gives a stable cutting condition. FC-32 castings have been stress relived and annealed. 5. Hardened and ground ways is hardness HRC 60. The opposite ways and gibs are all Turcite-B plated with hand scraped bearing surface. 6. Automatic lubrication pump is provided as standard accessory to ensure all the bearing surface and screws are well lubricated. 7. 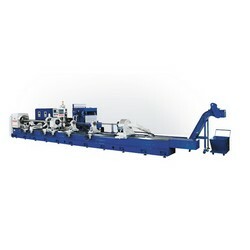 All box way design provides rigidity for heavy cutting. 8. Type WR is the workpiece rotation. TR is the drilling head rotation, workpiece fixed on the fixture. 9. CE mark is available for special required. Drill Spindle Feed (Z) Servo motor 850~1300W / 5.39~8.34 N.M.
Standard Accessories 1. Heat exchanger for spindle head bearing circular oil.